These kid-favorite breakfast cups layer ham, scallions, cheese, and eggs in muffin tins to make low-fat mini casseroles. 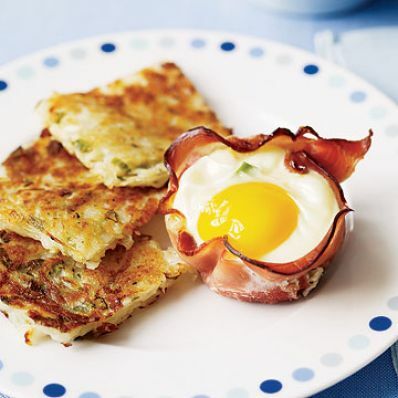 Hash brown potatoes add a finishing touch to this recipe. 1 of 3 Preheat the oven to 400 degrees F. Coat 8 muffin cups with cooking spray. Set aside. 2 of 3 Position 1 slice of ham in each of the muffin cups, doubling each slice over to insure that there are no holes in the bottom of the ham "cups." Sprinkle 1/2 tablespoon of the cheese and about 1/2 tablespoon scallions in the bottom of each cup. 3 of 3 Place one raw egg in each ham cup. Sprinkle each egg lightly with pepper. Bake about 15 minutes or to desired degree of doneness. Carefully remove the egg cups using the ham to lift onto serving plates. 1 of 3 Peel potatoes. Grate them using the coarse side of the grater and squeeze out water. Place grated potatoes in a small bowl and toss with scallions, salt and pepper. 2 of 3 Heat 1/2 tablespoon vegetable oil in a nonstick 10-inch skillet over medium-high heat until very hot. Place potato mixture in pan and flatten to cover bottom with a spatula. Cook for 7 minutes or until deep, golden brown. 3 of 3 Place a dinner plate over skillet and flip them both over, so browned side of hash browns is facing up. Place remaining oil in skillet and reduce heat to medium. Carefully slide hash browns back into skillet and cook for an additional 6 minutes, or until deep golden brown. Remove from pan and cut into wedges. Per Serving: 3 g sat. fat, 299 mg chol., 458 mg sodium, 2 g carb., 8 g Fat, total, 132 kcal cal., 12 g pro.